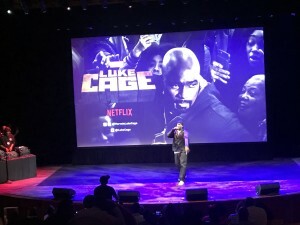 The second season of “Luke Cage” (Netflix, streaming) begins tonight on the service, but had a premiere party the other night at the Kennedy Center celebrating Marvel’s bulletproof brother from Harlem. As interesting as the first season was — and of Cage’s Netflix origins in “Jessica Jones” — the first two episodes they showed seemed to reflect more of the comic book origins, with contrived situations and scenes of pathos, requisite action segments and straightforward villains. By now in the story Cage (the ever laid back Mike Colter) has become a renown community hero with a celebrity that sometimes gets in his way. Alfre Woodard returns as a kind of crime queen, accompanied by Theo Rossi’s cliched gangster portrayal. But this season features a new crime foe in the neighborhood, one who even without Kryptonite can exploit Cage’s vulnerabilities. The season premiere, surprisingly, is directed by Lucy Liu. But both episodes seemed a bit underwhelming. The Kennedy Center event hosted by showrunner Cheo Hodari Coker seemed to pick up only once the screening was over. That’s when Coker, who fancies himself as big a music fan as he is a comics book nerd, brought out none other than KRS-One to freestyle, bring back some of his classics, and introduce a new track that clearly explained the illogic over illegal immigration (no person is illegal, and that contested land was once Mexico’s). 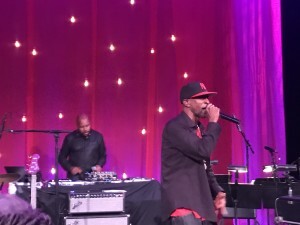 KRS-One is featured in the new season, but the second episode had an arresting musical interlude from bluesman Guy Clark Jr.
At what was called the Harlem’s Paradise Afterparty in an adjoining ballroom, DJ Nice, once of Boogie Down Productions (but who also discovered Kid Rock) spun some old school tracks, making way for The Midnight Hour, the jazzy group that provides a lot of the incidental music for the series. It’s led by Adrian Younge, a composer who has worked with Ghostface Killah and Jay-Z, along with Ali Shaheed Muhammad of A Tribe Called Quest. Their cool approach with a group that included a couple violins and horns seemed insufficiently amplified for the room, and when they brought in a teenage vocalist, she was so difficult to hear, she did her whole song over again. Things were better for Joi, who made an impression with her one track. And another teenager briefly featured was the teenage YouTube guitar whiz from Clarksdale, Miss., Christone “Kingfish” Ingram, who tore up B.B. King’s “The Thrill is Gone” in high style. Rakim at 50 is not a kid any more, but neither was a lot of the crowd. Nevertheless, everyone in the room, kids and grandmas, and members of the Congressional Black Caucus in attendance, had every one of these rhymes embedded and deeply seared into the memory — a real life superpower every bit comparable to the night’s fictional honoree. This entry was posted in Music, What's On TV. Bookmark the permalink. Both comments and trackbacks are currently closed.